1) 75 NEW MILES OF SINGLETRACK! By improving the fidelity of of our route (thanks to riders like you submitting their GPS files) we were able to more accurately analyze the percentage of singletrack. This, with several alignment tweaks in the Fremont and Deschutes Tiers has brought the total miles of singletrack to 415—or 62% of the whole Oregon Timber Trail! Thanks to our hardworking volunteers and ambitious Stewardship Campouts we've substantially improved the trail quality in each of the four tiers. Dozens of miles of trails that were unrideable two years ago now lay open for all to enjoy. Just over this past Memorial Day weekend we cleared 130 miles along the Fremont Tier. These trail maintenance improvements not only make trails more sustainable, but also make them a little easier. You may notice our ratings have have lessened slightly in several segments, and some riders will be able to complete the trail more quickly. With all the pioneer riders tackling the trail last year there was bound to be some errors found along our GPS track. We collected feedback from over 90 riders and tweaked the route and guide based on their suggestions. Many of you asked how to access the OTT. For 2018 we've added over 50 trailhead POIs that serve as your portal to the OTT. Head out for a day, a weekend, or a month! Getting to the Southern Terminus of the OTT still remains a challenge, but we've added another leg extending into California that makes it a little easier. The Sage Stage bus can take you and your bike to Alturas, 60 miles south of the border, from Reno, Redding, or Klamath Falls. From Alturas we've developed a route up and over the Modoc National Forest's Highgrade Trail to Cave Lake. What's next? Maybe a connection all the way to Downieville or Lake Tahoe! While our extensive route files are thorough and detailed, they take a basic level of digital competency to use. We saw the demand for maps, and produced this collection of 8.5x11 maps at a 1:36,000 scale. These are georeferenced (to show your location) for use on a phone as well as being optimized for printing at home. While the majority of our trail users are seeking solitude and a remote backcountry experience, they still need to eat. For 2018 we've identified the 9 Gateway Communities that make the Oregon Timber Trail experience possible. 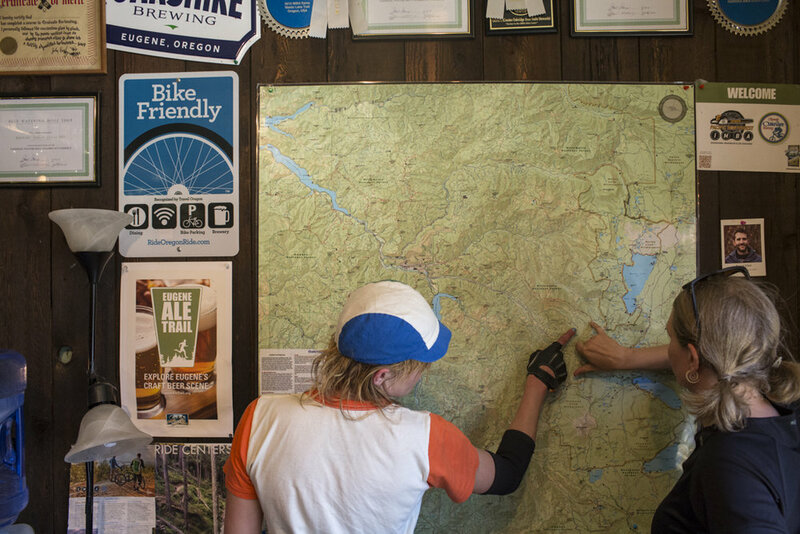 Find saloons, 30oz steaks, hot springs, farmers markets, bike parts, laundromats, a clean bed, or whatever other creature comforts you've been craving in these outposts across Oregon. All these updates and improvements have taken a considerable amount of work. This lengthy route guide and hundreds of detailed route files are provided to you at no cost. We're happy you're interested in exploring Oregon! If you find these resources valuable, please consider donating to the Oregon Timber Trail Alliance. We're working constantly to maintain the trail, build new singletrack, and improve your backcountry experience. Thank you.